Metals and stones resonant to different harmonic frequencies, which we may not be consciously aware. Many people chose the jewelry they wear based not only on the metal, (alchemy of consciousness), but on the stones as well. Jewelry is more than sentimental attachment, is serves more than one function. Both metal and stones, or crystals, pick up human frequencies and become conductors and amplifiers of energy. This can helps us connect with the other side, brings us energies and balances us. They are often linked with the chakra system. When someone dies, say a mother, the child will wear her jewelry to connect with her frequency, all we are is frequency, and get power from that object. In the same way we chose a crystal, we chose the stones needed to amplify our energies. Notice the jewelry you wear on a regular basis. What are the stones? What is the metal? Check out what they physically do to enhance your energies. Psychometry works best with metal objects. Metals are chemical elements that readily conduct electricity and heat, form cations and bonds ionically. Metal, or gold, is one of the five elements of Chinese alchemy. The archetypal metals are silver and gold. Metal is associated with the west and autumn, the planet Venus and the color white. It is believed to govern the lungs. It is associated with organization and stability. Other qualities associated with metal are unyieldingness, persistence, strength and determination. The metal person is forceful and set in their ways as metal is very strong, but they are self-reliant and enjoy the good things in life. The element metal plays an important role in Chinese Astrology and feng shui, the Chinese form of geomancy. Electrum is a naturally occurring alloy of gold and silver, with trace amounts of copper and other metals. Color ranges from pale to bright yellow, depending on the proportions of gold and silver. Gold content of naturally-occurring electrum in modern Western Anatolia ranges from 70% to 90% in contrast to the 45-55% of electrum used in ancient Lydian coinage of the same geographical area. Electrum was used as early as the third millennium BC in Old Kingdom Egypt, sometimes as an exterior coating to the pyramidions atop ancient Egyptian pyramids and obelisks. Electrum was also used in the making of ancient drinking vessels and coins. Allegedly electrum was used in the breastplates of the Urim and Thummim of the priests combined with specific stones/tones. Electrum consists primarily of gold and silver but is sometimes found with traces of copper and other metals. As a result, electrum is usually a good conductor of electricity. Analysis of the electrum composition in ancient Greek coinage dating from 600 BC showed that the gold composition was 55.5% in archaic Phocaea. In the early classical period, the gold composition of electrum ranged from 46% in Phokaia to 43% in Mytilene. In later coinage from these areas, dating to 326 BC, the gold composition averaged 40% to 41%. The color of electrum is pale yellow or yellowish-white and the name is a Latinized form of the Greek word (elektron) mentioned in the Odyssey meaning a metallic substance consisting of gold alloyed with silver. The same word was also used for the substance amber, probably because of the pale yellow color of certain varieties, and it is from the electrostatic properties of amber that the modern English words "electron" and "electricity" derive. Electrum was often referred to as white gold in ancient times but could be more accurately described as "pale gold". The modern use of the term white gold usually concerns gold, silver and palladium alloys. Electrum is mentioned in an expedition sent by Pharaoh Sahure of the Fifth dynasty of Egypt). Electrum is believed to have been used in coins circa 600 BC in Lydia under the reign of Alyattes II. Electrum was much better for coinage than gold, mostly because it was harder and more durable, but also because techniques for refining gold were not widespread at the time. The discrepancy between gold content of electrum from modern Western Anatolia (70-90%) and ancient Lydian coinage (45-55%) suggests that the Lydians had already solved the refining technology for silver and were adding Ag to the local native electrum some decades before introducing the pure silver coins cited below. 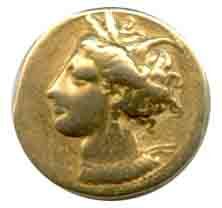 In Lydia, 14.1 grams of electrum was made into one stater (meaning "Standard"). A stater was about one month's pay for a soldier. To complement the stater, fractions were made: the trite (third), the hekte (sixth), and so forth, including 1/24 of a stater, and even down to 1/48th and 1/96th of a stater. The 1/96 stater was only about 0.14 to 0.15 grams. Because of the variety of electrum's composition, it was rather difficult to determine the exact worth of each coin. Widespread trading was somewhat hampered by this, as a foreign merchant would offer rather poor rates on local electrum coin. These difficulties were eliminated in 570 BC when pure silver coins were introduced. However, electrum currency remained fairly popular until approximately 350 BC. The simplest reasoning for this would be that, because of the gold content, one 14.1 gram stater would be worth as much as ten 14.1 gram silver pieces. In the fictional Star Wars universe, Jedi Master Mace Windu wielded a lightsaber that had a hilt made of electrum (only members of the Jedi Council were permitted to make such a saber). This was cosmetic only. The Sith Lord Darth Sidious also constructed a lightsaber that had a hilt made of electrum. A naturally-occurring golden alloy named electrum featured in the Transformers episode, The Golden Lagoon, but featured the additional unusual property of rendering Transformers immune to damage when coated in it. However, it proved to be vulnerable to intense levels of heat. Before 3rd Edition, an electrum coin (electrum piece) was worth five silver pieces (half a gold piece) in the Dungeons & Dragons role-playing game. Its removal was the final part of the decimalization of D&D currency. The Terry Pratchett book Pyramids features an Electrum-plated Pyramidion that was used in a failed attempt to "flare off" the time stored in a magical pyramid. In the Rex Mundi comic, electrum is a rare metal valued by sorcerers for its ability to focus magical energies. One of Jaden YukiÕs monsters from anime series Yu-Gi-Oh! GX is named Elemental Hero Electrum (Although it's Japanese name is Elixirer), named so because of its gold and silver armor. In alchemy and (occult) magic, Electrum is an alloy of equal parts of all the planetary metals. In Final Fantasy XII, the abnormally high-level and rare enemies called Entities will leave behind Electrum if they are vanquished by the element counter to their own elemental alignment. There is something about alchemy, metals, crystals, old and new elements and tonal frequencies that is the key.